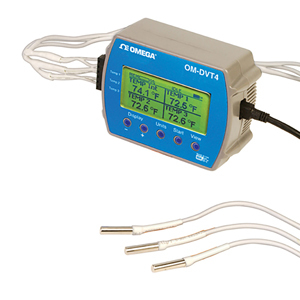 The OM-DVT4 temperature data logger with display is an easy-touse, versatile device which can be used for a wide range of logging applications. The OM-DVT4 records and instantly displays trends for up to 4 temperatures using one internal and three external sensors. The large, clear display shows all channels simultaneously, as well as the temperature difference between channels. When you’re ready, download up to 87,000 data points to your PC for further analysis. Data logging has never been this visual! The OM-DVT4 is capable of sampling as fast as once per second or as slow as every 18 hours. A total of 87,040 temperature measurements can be stored in the data logger memory (21,760 measurements per channel). Visual over and under temperature alarm indicators are available for all four channels. Easy-to-use Windows software is included with the OM-DVT4. The software is a full-featured program that allows you to set up all data logger functions including sampling rate, logging duration, start mode, logging mode, and high and low temperature alarm values. Once data has been logged, the program then allows you to download data from the logger, plot the data and export the data to an ASCII text or Excel file format for further analysis. Calibration: User single point offset calibration is available through software for all temperature channels. Calibration can be password protected. 43,520 points for 2 temperatures, 87,040 points for single temperature. Battery Life: 1 year continuous use, 2 years average use. The logger automatically turns itself OFF after 1 hour, when not logging. Turn ON by pressing any button. Data Security: Unique factory set logger ID. Recording session counter. Password protected calibration. Recording Start: On button press, immediate after setup, or at a user specified date and time. Real Time Status: Visual indication through the status LED. Software real time status. 참고: Comes complete with operator’s manual and Windows software on CD ROM, 3 “AA” batteries, set of 3 external temperature probes and 1.8 m (6 ft) USB interface cable.